Merciful cloud banks rolled in off the West Hills. It raged rain all night, winds around the shattered space. A gale force howls the last words of Bill Burroughs and Hassan Sabbah through a dry cellar hole socket and the hungry dinosaur jaws of the backhoe. But words are lost on deaf planning committees, the cockroaches of Pinnacle Management, the blind eye of the Pearl District, the Widmers come and gone, the glass case mummy hearts of zoning committee and chamber of commerce shoveling dirt on the American Dream. 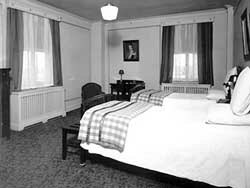 The newspaper told me of the death of the St. Francis Hotel. I can still see the way she looked. The scrolled front of the frame still stands, the long windows. Old Glory flapping from semi-horns, half-tank beds loaded to groaning with those walls. Portions of the building will be recycled. When they get to the bottom, they will discover that a piece of Portland's heart has been torn out. Construction workers in fireproof suits scuttle over the wall with roaring saws that send up showers of sparks from the beams. The pressed-tin fleurs-de-lis of the fallen awning show for the first time since the days when Van Sant hung out at the real Satyricon. The fire escape Mary and Jamieson and I dared to hang out on is a bent, mangled synapse. The front face of the Golden Dragon on the left, that room just beyond the lobby where it was cashing up pennies in famine and feasting on prawns when the checks came through, is now a cracked pushed-in rotten.com motorcycle skull. The boxes of unclaimed stuff sent out and away, like the free desk by the little old-time phone booth in the lounge, where you left the things you couldn't carry when you moved. I number my jewels: a green cardigan, a pair of Cross Colors jeans, a novel nearly finished, some Beethoven symphonies, a steel ball bearing, fourteen-eye combat boots with one squeaky heel, three white dress shirts, a cable-knit sweater and a sense of the miraculous. She may not be there anymore, but they cannot tear her out of me. I can walk down Eleventh any time I want, raise my hand like Lamont Cranston, and the air shimmers for me. The windows are lead crystal again. All the brain-cases chillin' in the lobby. The computer still on from when I left. I hobble back, puzzled defeat in my eyes, sparks settling in my hair. The Park Blocks are a Tom Tykwer time-lapse  so fast, so fast; beetle shells of umbrellas pushed forward to stay up against the wind. The sounds washing over are a backwards mask; muffled, muted, yet echoey. Everything goes on, but diminished. See more from Edward in our archives.